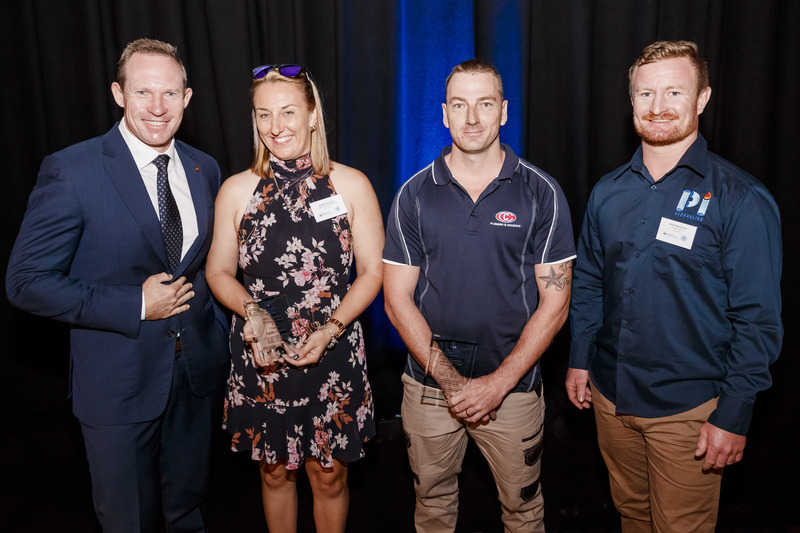 This morning Master Plumbers’ Association of Queensland (MPAQ) revealed the 2019 Queensland Plumbing Ambassadors, which comprises of one licensed plumber and two plumbing apprentices. The announcement was made in front of over 340 attendees at the World Plumbing Day Industry Breakfast, which was held at Sofitel Brisbane. World Plumbing Day aims to spread awareness of the importance of plumbing and plumbers in protecting public health as well as celebrating all the important work plumbers have done to improve the world. This event provided the perfect platform to announce this year’s ambassadors, who will be promoting this important trade to school students and career-seekers across the state. Daniel McClinton, owner of PI Hydraulics Pty Ltd, was announced as one of the 2019 Queensland Plumbing Ambassadors. Daniel has been a part of the plumbing and gas industry for 15 years and started his own business over three years ago. His qualifications include plumber, gasfitter, and metal fabricator. This year, MPAQ has also appointed two apprentices to be Ambassadors as well: Natalie Christian from JRW Gas and Plumbing and Patrick Wright from Christopher Contracting Plumbing and Drainage Pty Ltd (CC P & D). Due to start the second year of her apprenticeship in May, Natalie Christian has been working in the industry on and off for approximately 21 years. So far Natalie has completed all of her practical experience in the company she owns with her husband. Over the years, Natalie has gained valuable experience in the day-to-day running of a business, such as dealing with customers and employees, as well as the environment that comes with being on the tools. This offers Natalie a unique perspective as an ambassador, with the experience of running a business and now undertaking an apprenticeship. Having started as a trade assistant, Patrick Wright is an apprentice plumber who has worked for approximately seven years in the plumbing and gas industry. Patrick has worked on a number of major jobs so far, including the Gold Coast Private Hospital and the Commonwealth Games Athletes Accommodation. “With the wealth of industry experience and diversity of these three ambassadors, we are able to focus on the industry as a whole, both male and female, ensuring the longevity of our industry,” Ms Cornah said. Congratulations to Daniel, Natalie, and Patrick on being appointed as this year’s Queensland Plumbing Ambassadors for MPAQ. World Plumbing Day is an international event on 11 March initiated by the World Plumbing Council. World Plumbing Day seeks to highlight the vital role that plumbers play in maintaining and protecting the health and safety of the community through the provision of clean drinking water and the appropriate management of waste. The plumbing industry makes an extraordinary contribution to human health, the environment and prosperity; however, it is minimally recognised. In recent years, we have seen an increase in awareness of water and energy usage, and the plumbing industry is proactive in promoting the accurate and timely management of water supplies. Population growth coupled with an increase in urbanisation reveals that management of water supplies and waste water services is of paramount importance in Australia. Plumbing plays one of the most vital roles in managing the health and safety of the local community, as well as the wider community. It is for this reason that it is so import that plumbers are publicly recognised for their hard work and long studied skills.